The boat appeared some time last week and is tied to two stakes hammered into the river bank. 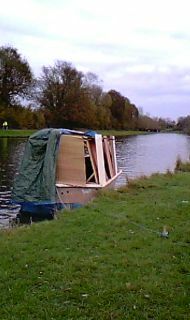 The boat was previously moored on Stourbridge Common and various materials, which appeared to be related to the boat, are scattered around the boat on the river bank. The boat does not appear to be be licensed and is a real eyesore. Calls to various authorities indicated they were aware of the problem and were taking what action they could.